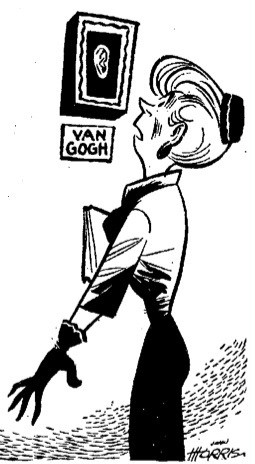 In November 1935, the Museum of Modern Art in New York City hosted an exhibit of Vincent Van Gogh's work. It was the first time many of the paintings had been displayed in America, and the exhibit received widespread media coverage, attracting record attendance. Thousands of people crowded into the museum every day. 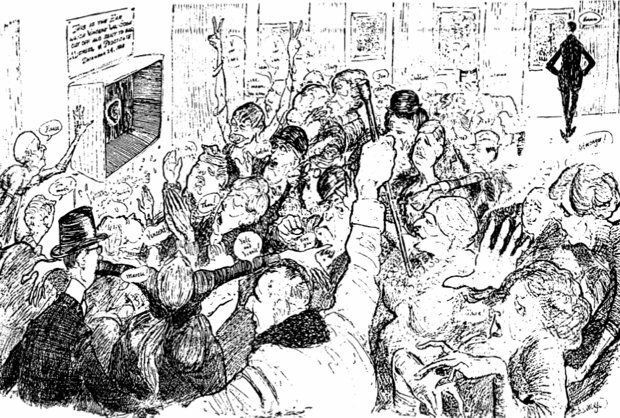 The illustrator Hugh Troy wanted to see the show, but he was frustrated by the huge crowds which made it hard for art lovers such as himself to view the works. He was also convinced that most of the people lining up to get into the exhibit weren't there because of an appreciation of art, but rather because of a lurid interest in the sensational story of Van Gogh's personal life — particularly how the troubled artist had once cut off part of his ear. 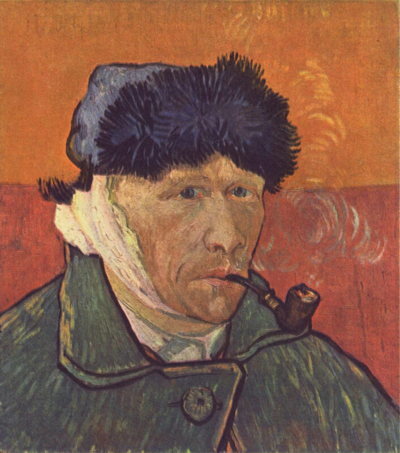 The story of Van Gogh's ear is that he cut it off in December 1888, after an argument with fellow artist Paul Gauguin. A few months before, Van Gogh had persuaded Gauguin to come live with him in Arles, envisioning that the two of them could start an art collective together. But Gauguin had quickly grown tired of Van Gogh's erratic behavior, and in December announced his decision to leave. Despondent, Van Gogh confronted him with a razor blade, but then ran to a brothel where, in despair, he cut off part of his own ear. (There's controversy about how much of the ear exactly he severed — most of it or merely the lower half.) Van Gogh wrapped the ear in newspaper and presented it to a prostitute named Rachel, telling her to "keep this object carefully," before he staggered home and collapsed in bed. A year-and-a-half later, he committed suicide. "This is the ear which Vincent Van Gogh cut off and sent to his mistress, a French prostitute, Dec. 24, 1888." Soon a large crowd was gathered around the ear, ignoring the paintings. Troy, meanwhile, was able to examine Van Gogh's works in peace. As with many of the tales of Hugh Troy's pranks, there's little evidence to raise it above the level of an anecdote. In all the media coverage of the 1935 Van Gogh exhibit, there was no mention of the display of a fake ear. The first time the story appeared in print was in 1953, when Harry Allen Smith included it in his book The Compleat Practical Joker, along with accounts of many other of Troy's jokes. However, Smith provided no sources for the story, presumably having heard it from Troy himself. The journalist Neil Steinberg, while writing a history of pranks (If At All Possible Involve a Cow, 1992), came to the conclusion that most of Troy's pranks were apocryphal, noting, "there is little hard evidence of his having actually done many noteworthy pranks." Steinberg coined the term "Hugh Troy Syndrome," meaning the tendency for the feats of legendary pranksters to melt away when closely examined. Of course, absence of evidence is not evidence of absence. It's possible Troy really did display a fake ear in the Van Gogh exhibit. But ultimately we only have his word for it, which isn't the best of references. Did Van Gogh Really Cut Off His Ear? In 2009, two German art historians, Hans Kaufmann and Rita Wildegans, published a book (Van Gogh's Ear: Paul Gauguin and the Pact of Silence) in which they questioned whether Van Gogh really did cut off his own ear, as had long been assumed. They argued instead that Gauguin cut off Van Gogh's ear with a fencing sword. According to their version of events, Gauguin and Van Gogh got into an argument. Van Gogh threw a wine glass at Gauguin who, defending himself, picked up a fencing sword and sliced off Van Gogh's ear. Kaufmann and Wildegans point out that Gauguin was an avid fencer and kept a collection of swords. Also, the story of Van Gogh cutting off his ear traces back to Gauguin himself, who may have been covering up his own culpability. Van Gogh never specified how he lost his ear. The two historians argue that Van Gogh maintained his silence because he didn't want to lose Gauguin's friendship. Although Kaufmann and Wildegan's theory is plausible, it hasn't met with much acceptance by other scholars. Louis Van Tilborgh, curator of the Van Gogh Museum in Amsterdam, notes that their theory is pure speculation. In an interview with NPR, he said, "What really happened between the two, we do not exactly know. There are only the words of Gauguin. And, I mean, the police did not arrest him. There's no sign from a letter of Vincent that confirms that." Smith, H.A. (1953). The Compleat Practical Joker. Garden City Books. Wolfe, Thomas. (1962). "King of Hoaxers Deals His Jokers Like a Real Ace." The Washington Post. Steinberg, Neil (1992). It At All Possible Involve a Cow. St. Martin's Press. New York.